A slight diversion from bread baking. After a quick visit to Belgium over the New Year, lured in by the delicious smell of waffles several times, we could not help but go on a quest again and make our own. Fresh from the waffle plate, still warm, they are delicious. A crispy outside with caramelized sugar and a sweet buttery fluffy interior. Who can resist?! 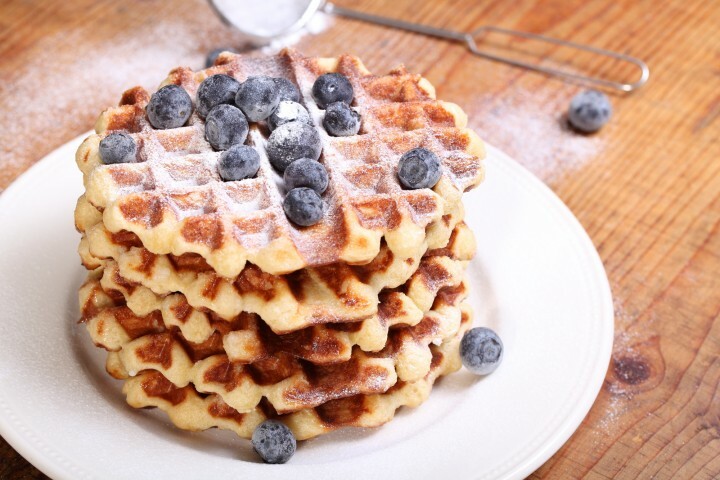 We found a wonderful waffle recipe with lots of background information (you can find it here) that worked very well for us, but we changed and simplified a few things. The most important thing we changed was cutting the amount of pearl sugar in half. As you can judge from the picture both sides of the waffle dough ovals are still generously coated in the sugar. For us the result is just perfect and we would not want it to be much sweeter. But of course you can experiment with the amount and see what you like best. There were many steps to the original recipe, but we have to be honest and tell you that we skipped a few (even one described as essential) in our version because we did not detect much difference in the end result. We also changed / simplified the mixing process, based on how it behaved in our mixing bowl. In the bowl of your standing mixer, combine the milk and water with the instant yeast. Add the egg and 80 g of the flour. Mix at low speed for a minute to blend. Now sprinkle the remaining 160 g of flour over the mixture, but do not stir! Cover your bowl with clingfilm and let it stand for 60 minutes. After this rest you will hopefully see the batter bubble up through the flour (see picture on right). Now add the sugar, salt, honey and vanilla on top of the flour bubble mixture in your bowl and combine. Add the softened butter and knead for 4 minutes. Give the dough a 5 minute rest and then mix again for 3 minutes. The dough should be forming a sticky ball. Transfer the dough to a greased bowl, cover and leave to rest at room temperature for 3 to 4 hours. Turn out the dough on a lightly floured work surface and give it one stretch and fold (a full letter fold, left over right, right over left, bottom over top, top over bottom) so you will end up with a squarish piece of dough. Put it back in your bowl, cover and refrigerate overnight. Take your square of dough from the fridge and divide it into 5 equal pieces of around 110 g each. Shape these pieces into ovals. Sprinkle 15 grams of pearl sugar on your workbench, take a piece of dough and press both sides in the pearl sugar, like you see in the gallery below. Take the next piece of dough, again sprinkle 15 grams of pearl sugar on your bench and press a piece of dough in it. Continue this until the 5 pieces of dough are all covered in pearl sugar. Indication for temperatures and baking time: A professional heavy cast iron waffle plate should be around 185 ºC / 365 ºF. The waffles should take around 2 to 3 minutes to bake. A home baker appliance like ours needs to be heated to 190 ºC / 375 ºF, and the waffles take 2.5 minutes to bake to perfection. Preheat your waffle iron at the lowest setting. Even this can be too hot for the waffles not to burn. We open the waffle iron for 30 seconds to cool it down a bit before putting on the first piece of dough. We use a infrared thermometer to check the temperature of the waffle plates (see picture). Bake your waffles in the preheated waffle iron. We use a not so professional (Tefal brand) snack apparatus with waffle plates and did a few test runs to determine the right method and temperature to turn out perfect waffles. The most important thing is to caramelize the sugar and not to burn it. It is best to continue baking one waffle after the other. This way the butter and sugar residue left on the plates does not burn when the iron is without waffle! We preheat at setting 1 and bake at setting 2, but this only works if you bake continuously! We also found out that with our home style waffle iron it works best to bake one waffle at a time. Even though the iron can bake two waffles in one go, we get the best and more even bake if we bake on waffle in the center of the two plates (see picture). You should aim at a baking time of around 2 to 3 minutes, the waffle should have a beautiful golden color (on our waffle maker it takes 2.5 minutes). If the waffle is too light carefully raise the temperature, if it is too dark, lower the temperature. It is best not to increase or decrease the cooking time because you could end up with a dried out or undercooked waffle. After the first 30 seconds of baking, without opening the waffle iron, press the two halves together once. The dough ball expands between the two plates during baking and this way the dough is forced sideways. To clean the waffle plates of an electric waffle maker first unplug it, then carefully pour some water on the bottom plate and close the lid. The steam will clean the plates. Wait till it has cooled. Now the plates are very easy to clean under a running tap. Works perfect for us! Hi, I’m excited to try this recipe. 50g egg … Is that around 1 egg? I guess I can mix one up and weigh it. Is there something I can do to replace the honey, or if I just omit it, will it still turn out? My wife is pregnant and doesn’t want to chance eating any unpasteurized honey, which is what we have. We know it can be different depending on where you live, but here in Holland it is about one medium egg. Would be good to crack one in a bowl and weigh it, to know how the eggs you use compare. To substitute the honey we would add 10 g of sugar instead. Hope it will turn out great (the smell alone is worth it) and wishing you all the best with your family! Hello, just wondering if pearl sugar can be omitted? Thank you. Although we have never tried it without, we are sure you could omit it and add something else for sweetness afterwards. We would probably prefer to make something else altogether ourselves instead of the waffles without the sugar because the caramelized pieces of pearl are sort of the crowning jewels in these waffles and they will be a bit naked without them. We understand what you mean however and that is why we already halved the sugar compared to the traditional amount used and it is still more than enough. The dough without the pearl sugar will still have a very good taste we are sure. Would love to hear your results and possible additions for your waffle recipe. Ziet er weer lekker uit! Ik ga de parelsuiker ook eens proberen te maken. Ik heb een wafelijzer voor op het vuur (van de rommelmarkt) 🙂 . Om de temperatuur te meten heb ik ook een digitale infrarood meter. Wat is voor jullie de ideale gemeten temperatuur van het ijzer? Hoi Mike, zoals in het recept staat, wij bakken op een ijzer van rond de 190C. You can easily make the “Parel suiker” yourself. Just Google how to make…. or search for a “Fryske Sûkerbôle” recipe . Happy baking to all ! Hi Farida, thanks great tip, never thought of making my own ‘parel suiker’. I just found a recipe on how to make them. Happy baking! I’d like to try these out, but I’m confused as to the baking process. The quote at the top says 2-2.5 minutes. But the instructions says to aim for 3 minutes. And, I do not understand the last step: “After 30 seconds, without opening the waffle iron, press the two halves together…” Are you talking about the first 30 seconds? If the waffle iron is already closed, what two halves are we pressing together? Hi, thanks for your remarks, we have corrected the recipe to make it more clear and consistent. Sorry for the inconvenience, Happy baking! can you help me with a Spanish equivalent to Pearl sugar? I understand that would be ‘azúcar perlado’. Hope you can find it there. Lekker recept! Het lijkt me echt beter dan de gewone Luikse variant! Als jullie ooit nogmaals naar België komen, laat me even weten. Ik kan jullie rondleiden in de Antwerpse bakkerijen. Dat klinkt als een fantastisch aanbod. Dankje! Mogen we je nog vragen wat je verstaat onder de ‘gewone’ Luikse variant? Ik vind het beter dat in jullie recept de deeg in de koelkast gist ! Meer tijd voor een complexe smaak! Mee eens! De ontwikkeling van smaak en geur is echt top..verslavend lekker!